Built in two stages, and designed by John and Wilson Ely, the Firemen's Insurance Co. on Park Place and Rector Street was begun in 1924 and completed four years later with the addition of the upper floors. The initial construction included the first three stories and the handsome Corinthian colonnade. Its exterior architectural elegance is matched by its ornamental interior design of richly carved wainscoting, mahogany pilasters and deeply coffered ceilings. The first-floor windows and doors reflected the best in design and local craftsmanship, and were crafted in bronze. In recent years, some Newarkers will probably remember the building as home of the Continental Life Insurance Co., and recall the time and temperature device located on the roof. Miles Berger, owner of the Robert Treat Hotel and refurbisher of the old Hahne's Department store, restored the Firemen's building as a first-class office center. Today it blends the best of classical design and modern office efficiency. The old American Insurance Co. (Rutgers-Newark Office of the Provost and the S.I. Newhouse School of Criminal Justice) also was designed by the Ely firm of Newark. It has been described as 'Newark's most elegant and graceful skyscraper.' Located next to The Newark Public Library, it has been referred to as the 'architectural masterpiece of John H. and Wilson E. Ely.' Completed in 1930, it incorporates all the elements of the classical architectural lexicon and serves as an efficient structure. The first four stories are of textbook design perfection and blend with the adjoining Library to the north and the Second Presbyterian Church to the south. Both Ionic and Corinthian columns are used for exterior decoration, and the 16-story rose brick office tower is topped by a classical cupola. Anybody who is a fan of Greco-Roman design should take the time to stare at the building for 10 minutes. The year 1916 marked a time when Newarkers were celebrating their 250th anniversary, 1929 was a period of economic agony when the stock market crashed, the 1940s were boom times for local industry and commerce, and the 1950s marked an era of revitalization in the downtown and the feelings people had about the city. However, after World War II and the Korean War, Newark's future was questioned by more than a few. In the 1950s, a very positive wind was blowing in Newark. 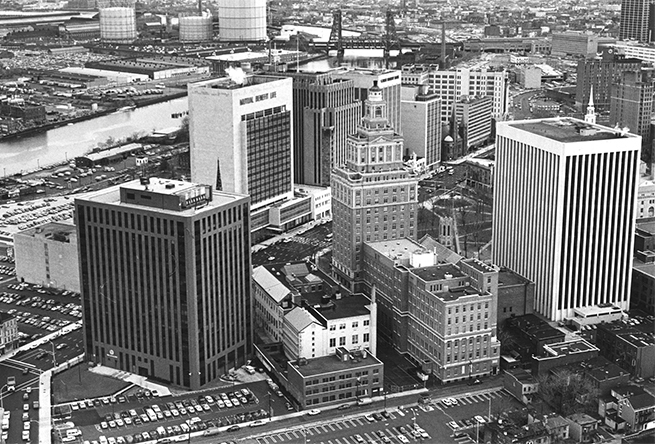 Led by Mutual Benefit Life, the Prudential Insurance Co. of America, Mayor Carlin, and a combination of chamber of commerce activities and selected business interests, the New Newark Movement was beginning to manifest itself in the city's first major construction building boom since 1930. The news that Mutual Benefit had decided to stay in town, followed by a massive endorsement by Prudential, seemed to ensure that the sun was not setting on a community soon to celebrate its tercentenary in 1966. Like the two art deco twins of the 30s, the Lefcourt and the National Newark and Essex buildings, the new headquarters of Mutual Benefit and the Prudential became the flagship sites of commercial Newark in the l950s. In 1956, Mutual Benefit topped off its fourth and present home at 520 Broad St. Its chief officers, W. Paul Stillman, chairman, and Bruce Palmer, president, were committed to keeping Newark financially strong and healthy. With a new commercial era on the horizon, a new architectural style was selected as Mutual Benefit left its classical office building in north Newark along Broadway. When settling on Broad Street across from Washington Park, the new style was 'strikingly modern with a green glass frontage framed in pure white sandstone.' Forty years later, the building looks as fresh as it did the day it opened. Within only a short time, the 7,200 tons of steel ferried up the Passaic River and fastened together by 100,000 rivets formed the skeleton of a building that measured 215 feet along Broad and extended 224 feet back to Atlantic Street. Thus was created the newest home of one of New Jersey's oldest commercial enterprises Mutual Benefit. With the demolition of the great Prudential castles along Broad Street, groundbreaking for the company's white marble tower took place in May 1957. The old Prudential's decorative water fountain was moved into the Newark Museum Garden and the front door lions were set in Branch Brook Park. The new building, which opened in September 1960, was designed by architect Voorhees, Walker, Smith and Haines, and built by Vermilya-Brown. The three basements, 46 feet below Broad Street, provided plenty of off-street parking. The twenty-four story exterior is covered with Imperial Danby marble from Vermont, the same stone used in the Jefferson Memorial and the U.S. Supreme Court Building in the nation's capital. The building has 67,000 square feet, or 11/2 acres, of glass in 1,600 windows set in aluminum window sills. The building's interior occupies 500,000 square feet, of which 400,000 is office space and the remainder is for parking and a few commercial tenants. Interior design was carried out by Maria Berysen of New York and Los Angeles. It is an impressive home for the world's largest insurance company. Across from Penn Station and adjoining the Newark Gateway Center is the Legal and Communication Center, also known as One Riverfront. It is a $74 million, 22-story, 475,000-square-foot showplace designed to attract and anchor commercial activities in the downtown. The center was conceived in 1983 and completed in 1989. It was dear to former Gov. Tom Kean, Mayor James, the Port Authority, and especially to the Newark Economic Development Corp., which worked on many of the details necessary for the building's construction. The triangular-shaped building is particularly attractive on a sunny day, with its soft pink outer wall outlined in the sun and its light blue mirrored glass reflecting the passing clouds. Grad Associates of Newark designed the 22-story building, which has 500,000 square feet of office space, and a granite and bronze lobby.